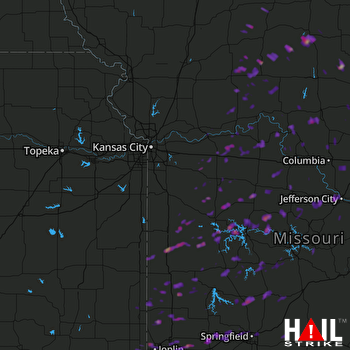 Doppler radar detected Quarter size hail near Bolivar, MO, Marshall, MO and Chillicothe, MO on December 4, 2017. This hail storm was traveling ENE at 44 mph and the entire storm produced hail for roughly 1 hour(s). There were 3 spotter report(s) with reported max hail size of 1″ and an average hail size of 1″. We estimate that 76,412 buildings were in the affected area and the probability of hail DHI detected was significant. Based on this information, you can expect to see minor damage to vehicles, tile roofs and crops in isolated areas (Impact Rating 2). 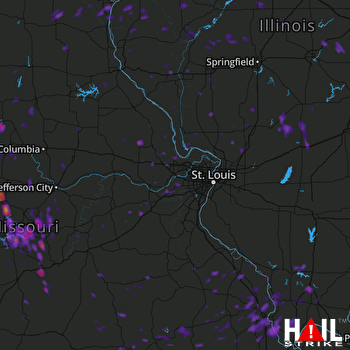 Doppler radar detected Half Dollar size hail near Arnold, MO, Edwardsville, IL and Collinsville, IL on March 1, 2017. This hail storm was traveling ENE at 50 mph and the entire storm produced hail for roughly 5 hour(s). There were 53 spotter report(s) with reported max hail size of 3″ and an average hail size of 1.49″. We estimate that 163,219 buildings were in the affected area and the probability of hail DHI detected was significant. Based on this information, you can expect widespread, severe damage to tiled roofs, automobiles, and aircraft over highly populated areas. Risk of personal injury is also high, and is often accompanied by other severe weather events (wind, tornadoes). 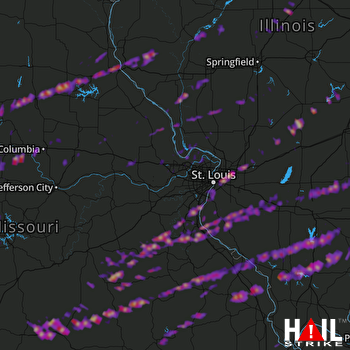 Doppler radar detected Quarter size hail near Columbia, MO, Nixa, MO and Ozark, MO on March 1, 2017. This hail storm was traveling ENE at 54 mph and the entire storm produced hail for roughly 6 hour(s). There were 62 spotter report(s) with reported max hail size of 2.5″ and an average hail size of 1.25″. We estimate that 130,524 buildings were in the affected area and the probability of hail DHI detected was significant. Based on this information, you can expect widespread, severe damage to tiled roofs, automobiles, and aircraft over highly populated areas. Risk of personal injury is also high, and is often accompanied by other severe weather events (wind, tornadoes). Doppler radar detected Quarter size hail near Neosho, MO, Carthage, MO and Gardner, KS on May 30, 2016. This hail storm was traveling N at 3 mph and the entire storm produced hail for roughly 3 hour(s). There were 1 spotter report(s) with reported max hail size of 1″ and an average hail size of 1″. 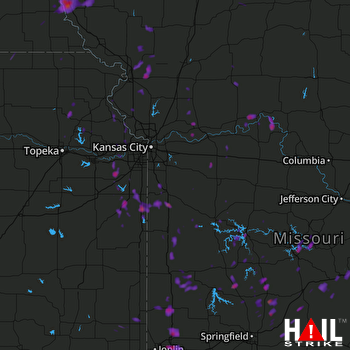 We estimate that 74,636 buildings were in the affected area and the probability of hail DHI detected was significant.Based on this information, you can expect to see minor damage to vehicles, tile roofs and crops in isolated areas (Impact Rating 2). 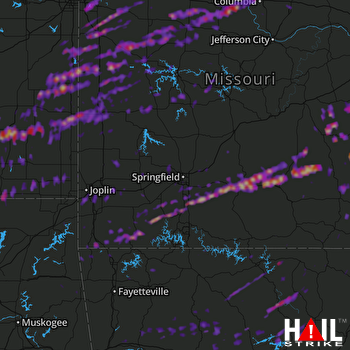 Doppler radar detected Golf Ball size hail near Marshall, MO, Vandalia, IL and Wright City, MO on May 26, 2016. This hail storm was traveling E at 27 mph and the entire storm produced hail for roughly 5 hour(s). There were 6 spotter report(s) with reported max hail size of 1.75″ and an average hail size of 1.75″. We estimate that 84,203 buildings were in the affected area and the probability of hail DHI detected was significant.Based on this information, you can expect to find damaged crops, glass damage, automobile bodywork damage, as well as isolated roof damage (Impact Rating 3).